Opposition leader Juan Guaido, who has declared himself the interim president of Venezuela, speaks during a press conference on the steps of the National Assembly in Caracas, Venezuela, Feb. 4, 2019. Venezuelan opposition leader and self-declared interim president Juan Guaido said Monday that President Nicolas Maduro is trying to transfer up to $1.2 billion to a bank in Uruguay. Speaking on national television after over a dozen European countries officially recognized him as Venezuela's leader, Guaido claimed, without presenting evidence, that Maduro was moving the money from state development bank Bandes to a financial entity in Uruguay. U.S. Secretary of State Mike Pompeo said the United States, which recognized Guaido as interim president last week, welcomed Monday's decision by European countries, including Austria, France, Germany, Sweden and Britain to follow suit. "We are also heartened by the European Parliament's January 31 resolution recognizing Juan Guaido as interim president. They join the United States and more than 23 other countries in recognizing Juan Guaido as interim president, in accordance with Venezuela's constitution," Pompeo said in a statement. The announcements came after a number of countries gave Maduro a deadline to hold free and fair elections, or else they would recognize Guaido, who declared himself interim president in January, as the leader of the South American country. Guaido said during a recent VOA interview he would order new elections "when we achieve the capacity to convene elections." First, Guaido said, "we have to achieve the necessary force in order for this usurpation to end." In New York Monday, U.N. Secretary-General Antonio Guterres said the United Nations will not participate in any groups of countries looking to resolve the political crisis in Venezuela. British Foreign Secretary Jeremy Hunt posted on Twitter: "Nicolas Maduro has not called Presidential elections within 8 day limit we have set. So UK alongside European allies now recognizes @jguaido as interim constitutional president until credible elections can be held. Let's hope this take us closer to ending humanitarian crisis." Spain's Prime Minister Pedro Sanchez delivers a statement at the Moncloa Palace in Madrid, Spain, Feb. 4, 2019. 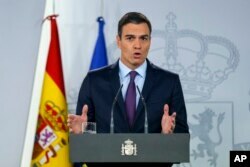 Spanish Prime Minister Pedro Sanchez said Monday in Madrid that "...we are working for the return of full democracy in Venezuela..."
French Foreign Minister Jean-Yves Le Drian told France Inter Radio that the Venezuelan crisis would end "peacefully" with an early presidential election. In Moscow, Russian President Vladimir Putin's spokesman, Dmitry Peskov criticized Monday's European declarations as "attempts to legitimize usurped power" and "interference in Venezuela's internal affairs." Canadian Prime Minister Justin Trudeau speaks at the Paris Peace Forum as part of the commemoration ceremony for Armistice Day, in Paris, Nov. 11, 2018. On Monday, Canada announced at an emergency meeting of the Lima group that it would provide $53 million in aid to Venezuela. 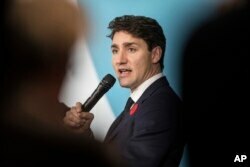 "The bulk of the funds will go to trusted partners and neighboring countries to help them support Venezuela and Venezuelans," Canadian Prime Minister Justin Trudeau told the group, which includes Canada and 13 Latin American countries.